I purchased the VLTOR VC-1 based on the recommendation of a good friend who is an employee of rather large internet gun shop. 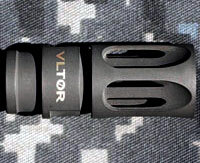 The VLTOR VC-1 was utilized for a project that involved taking my pristine early 1990’s COLT SPORTER MATCH H-BAR and upgrading it to a more modern configuration. Aside from being a great FLASH HIDER and COMPENSATOR ith VLTOR VC-1 was designed to accept many common SOUND SUPPRESSORS and more specifically the GEMTECH HALO SOUND SUPPRESSOR. Additionally the The VLTOR VC1 measures 2.1″ long making it perfect to bring a 14.5″ barrel to a 16″ overall length (with addition of BATFE approved pin/weld installation). To date I have been quite pleased with the performance of the VLTOR VC-1, unfortunately I decided to go with an AAC M4 2000 QD SOUND SUPPRESSOR. Highly-efficient internal helical design uses ten precisely contoured longitudinal ports combined with a unique, cloverleaf-shaped exit port to trap unburned powder particles long enough for full burn and dissipation of hot combustion gasses. Muzzle flash cancels itself out to minimize shooter exposure during daytime and low-light situations. Also serves as a compensator by directing venting gasses to help reduce muzzle jump and improve shooter control for better shot placement. Precision machined from 4140 steel to stand up to rough tactical operations. 2-1/8″ overall length brings a 14½” barrel up to legal length for civilian use when flash suppressor is permanently pinned or welded in place. 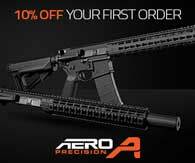 Accepts most sound suppressors and Blank Firing Attachments designed to fit a M16/M4 flash hider. VC-1 fits .223/5.56mm AR-15/M16/M4 rifles.